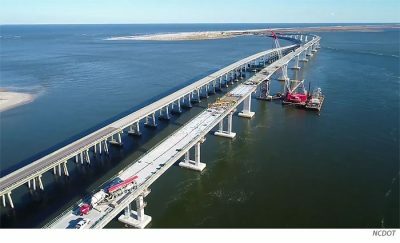 NAGS HEAD – North Carolina Department of Transportation announced Friday that the new bridge replacing the 55-year-old Herbert C. Bonner Bridge over Oregon Inlet should be open to traffic mid-February. Though mild weather and an accelerated pace of activity by contractors has led to the expected early opening of the new bridge, the date could be pushed back by inclement weather or other factors. NCDOT and area officials plan to host an informal community day 10 a.m. to 4 p.m. Feb. 9 to celebrate the new bridge with traffic expected to shift in the days following the event. NCDOT, Dare County, the National Park Service, and area groups are hosting the event in celebration of the completion of the Bonner Bridge replacement at the north end of the bridge near the Oregon Inlet Fishing Center, 8770 Oregon Inlet Road, according to a Thursday release. There will be remarks by Dare County Commission Chairman Bob Woodard at 10 a.m., with a blessing and a wreath-laying ceremony at the top of the new bridge at 11 a.m. The bridge will be open to the public for pedestrian and bicycle access from the north end of the bridge between 10 a.m. and 4 p.m. Limited shuttle service will be available. Park at Cape Hatteras National Seashore’s Oregon Inlet Boat Ramp parking lot. A formal celebration for the new bridge is being considered for early April, the details for which will be announced later. Currently, the contractors are installing guardrails and expansion joints and adding traction grooves to the bridge’s deck. Workers from Cape Hatteras Electric Cooperative are wrapping up attaching power lines to the new structure. The last step will be paintng lane markings on the new bridge before traffic will be shifted. After the new bridge is open, crews will begin dismantling the old bridge.